That and it being what looks like a USA spec (or German?!) machine. Last edited by Kazzie on Thu Dec 13, 2018 9:59 am, edited 1 time in total. See a hardware prototype of an automatic, non-destructive book scanner. The machine turns pages automatically, and captures high-resolution images of each page. It was developed in 20% time, and built in the Google Workshops. There will be a live demo and a short technical presentation, describing the design process. Published today, ExplainingComputers on running RISC OS on the Raspberry Pi. Last edited by Andrew_Waite on Mon Jan 07, 2019 5:08 pm, edited 3 times in total. Norman Quentin Cook, better known by his stage name Fatboy Slim, being interviewed in his recording studio with his Atari ST in the background. Last edited by Andrew_Waite on Sun Jan 13, 2019 2:53 am, edited 2 times in total. Another Electron restored: DuB-EnG: Retro Acorn Electron setup - RESTORE & replace the ULA Chip REFURBISH the Motherboard PCB. And another Electron fixed: Acorn Electron recapping and retrobrite - with a BBC Micro-style two tone beep on start-up. Adrian's Digital Basement. Adrian Black repairs a Spectrum and a pair of BBC Micros with the help of folk in the comments section of his YouTube videos. Last edited by Andrew_Waite on Mon Feb 04, 2019 4:07 am, edited 5 times in total. Moon Buggy for the Jupiter Ace, looking good. Featuring parallax scrolling. Xavier has asked me to post this, as being of possible interest. The ARM 250 SOC photo was taken from my A3010 images. I don't understand. I almost always allow use if requested and the only thing I explicitly prohibit is using my photo's to misrepresent what people are selling on ebay and similar sites. It's not that I make it hard for people to ask as I provide a contact form and link to it from the copyright notice and every page on the site too. He didn't ask me to post, but his Archie Shadow of the Beast demo is coming along nicely. The splash image is from the Amiga version, which is what I believe he is showing could have been done better on the Arc. Last edited by tricky on Sat Feb 16, 2019 10:27 am, edited 1 time in total. THE LIFE AND GAMES OF JOFFA SMITH, ZX SPECTRUM GENIUS. Another supurb Kim Justice video, this time about the late, great Jonathan Smith. Last edited by Andrew_Waite on Tue Feb 19, 2019 12:10 am, edited 2 times in total. A video on core memory with explanation & demonstration. 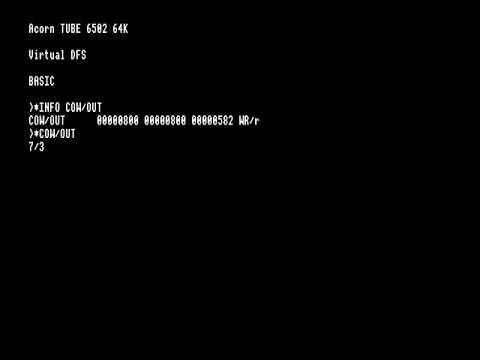 A simple CPU test on an emulated BBC Micro with Tube that crashed in a slightly more exciting way than I was expecting. Can that be done on a real BBC? That crash sounds an awful lot like the first program on the Electron's intro tape, so yes, I'd say it can. No, I mean if you crash the actual hardware, will the result be the same? It's not crashing anything, all it's doing is loading a file over the sound workspace. If you *LOAD anyfile 800 you'll get similar results. Woah, the BBC can do that and the manual never told us?? It sounds a bit like when I would crash a Nintendo game with the NES or Game Boy Game Genie random codes for quirkiness to sample or mess with. NETMON from the Econet disk in Beebem sounds 'officey' when you play it. And ooo, A.DARE from Beebem's games disk has something of a melody and riff too. I was sure this had been listed, but can't find it! Last edited by tricky on Sun Mar 03, 2019 10:17 am, edited 1 time in total. Tommy Boyd, ever the everyman. Now here's a Commodore 64 animated disk directory plus a BASIC routine to make your own. The teacher annoyed me with something like: "That's rubbish, you have to look up how to do things in a book"
Not sure if this has been posted before but check out the lego keyboard in this new C64! Some nice Commodore videos as we approach the 25th anniversary of Commodore International declaring bankruptcy on the 29th April 1994. Last edited by Andrew_Waite on Mon Mar 18, 2019 2:44 am, edited 1 time in total.